In Association for Molecular Pathology v. U.S. Patent and Trademark Office, No. 2010-1406 (Fed. Cir. July 29, 2011), [hereinafter “the Myriad case”] a three-judge panel of the U.S. Court of Appeals for the Federal Circuit reversed a district court decision that Myriad Genetics, Inc. patents to isolated DNA molecules encoding the BRCA1 and BRCA2 genes which control a hereditary predispositon to breast cancer, were patent-ineligible products of nature under 35 USC 101. The Court also reversed the district court’s decision that Myriad’s method claim to screening potential cancer therapeutics via changes in cell growth rates is directed to a patent-inelegible scientific principle. However, the Court affirmed the district court’s decision that Myriad’s method claims directed to “comparing” or “analyzing” DNA sequences are patent ineligible, because such claims include no transformative steps and cover only patent-ineligible abstract, mental steps. On March 26, 2012, the U.S. Supreme Court granted a petition for a writ of certiorari and remanded the case to the Federal Circuit for further consideration in light of Mayo Collaborative Services v. Prometheus Laboratories, Inc., 566 U.S. ___ (2012). This series will explore the background of genes and gene patents in order to provide basic understanding of the issues for patent practitioners and others. This first post introduces the science of production of proteins from DNA in the cell. Some details are passed over in order to provide a basic understanding. As set forth by the Federal Circuit in the Myriad case, and well-known for many years, living matter is composed, among other biochemical molecules, of proteins. Proteins are polymers (long chains) of chemical groups known as amino acids. Each amino acid in a protein is identified in a DNA (deoxyribonucleic acid) molecule by a three-nucleotide group composed of the four nucleotide bases adenine (A), thymine (T), cytosine (C), and guanine (G). The various combinations of these four nucleotides taken three at a time result in the genetic code. 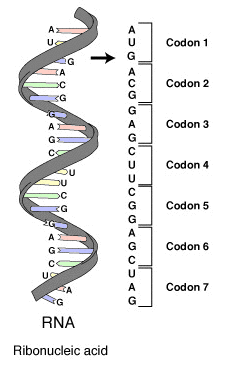 Each three-nucleotide group is known as a codon. Each codon codes for a particular amino acid. For example, the codon CAG codes for glutamine, CGA codes for arginine, ACG codes for threonine, AGC codes for serine, etc. A DNA molecule is a polymer of the four nucleotides in a linear sequence, and the sequence of nucleotides, taken three at a time as above, determines the sequence of amino acids in a protein. For example the genes denoted BRCA1 BRCA2 encode the corresponding proteins. In the cell, DNA exists as two polynucleotide strands intertwined in a double helix, in which A always pairs with T and G always pairs with C. One of these strands (the coding strand) encodes the protein. The other strand (the non-coding strand) does not. A protein is created from a gene in two steps. In the first step, known as transcription, cellular enzymes transcribe the sequence of codons into a corresponding ribonucleic acid (RNA). For transcription, the DNA double helix is unwound and each nucleotide on the non-coding, or template, DNA strand is used to make a complimentary RNA molecule of the coding DNA strand. The resulting RNA is called a “messenger” RNA (mRNA). This mRNA is then”translated” on a cellular structure known as a ribosome into the corresponding protein, one codon at a time. Amino acids are brought to the ribosime by RNA molecules known as “transfer” RNAs (tRNAs). 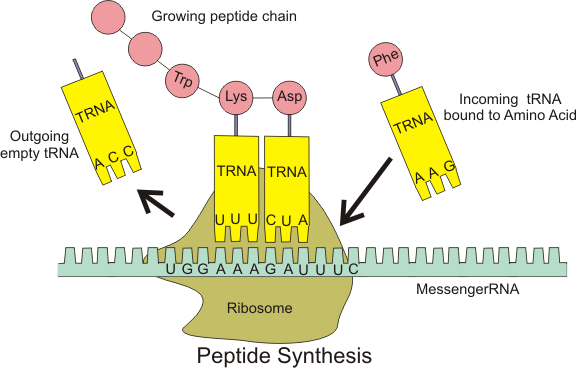 As each tRNA reaches the ribosome, the amino acid that it carries is incorporated into the growing protein chain. The tRNA then dissociates from the ribosome. In the cell, the DNA (“native” or “genomic” DNA) is packaged into 23 pairs of chromosomes, where it exists in a composite structure with proteins known as histones. Genomic DNA can be extracted from its cellular environment using a number of well-established laboratory techniques. A particular segment of DNA, such as a gene, can then be excised or amplified from the DNA to obtain the isolated DNA segment of interest. DNA molecules can also be synthesized in the laboratory. One type of synthetic DNA molecule is complementary DNA (cDNA). cDNA is synthesized from mRNA using complementary base pairing in a manner analogous to RNA transcription. The process results in a double-stranded DNA molecule.